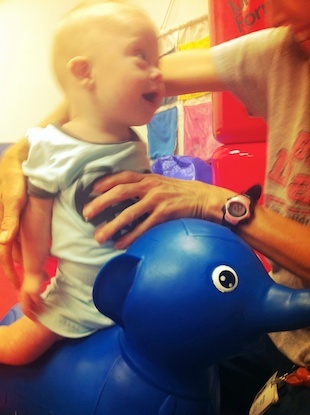 A few weeks ago Noah’s physical therapist started using a small inflatable elephant to help him develop the core strength required to sit up on his own. Even though it looked like a toy, it turns out it wasn’t. It was actually an expensive therapy tool that can only purchased from a medical supply company. I wanted to get buy one in order to help our little boy develop the core strength needed so that he could sit up on his own, but before we shelled out the cash I wanted to see if there was perhaps a cheaper alternative. After doing some research I found out that a lot of parents used (and were very happy) the Inflatable Rody Horse . So I figured why not. We ordered the Rody horse from Amazon, and once it arrived (in just two days. Thanks Amazon Prime!) and set up took all of about five minutes. Inflating the Rody horse required an air pump (we used a bicycle pump.) Since the Rody horse is manufactured in Italy, inflating it also required the use of an included special adaptor. I’m glad they included the adaptor because it wouldn’t have been fun trying to track one down in America. Rody and Noah are best buddies. Thankfully the plastic seems to be a very child-proof, and looks like it won’t tear easily. The box actually says the Rody horse will support up to 400 pounds…now that would really be something to see! The neck of the horse prevents Noah from sliding forward (which helps his development) and the ears of the horse allow him to grab hold so that we can find (and keep) his balance. 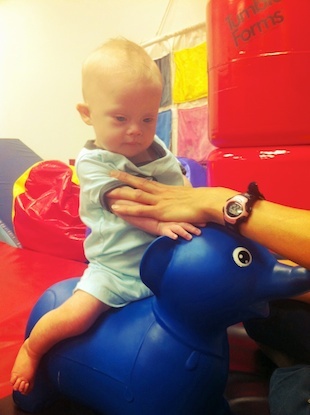 I think the inflatable Rody horse would be a great purchase for any parent who is interested in helping their child develop core strength and ultimately reaching their baby milestones! We’ve only had it a few days, but so far it gets two thumbs up. Additionally, they make a base for the Rody horse that turns it into a rocking horse. We don’t have it, but it seems like a nice add on. If you have any questions about it, feel free to contact us, and we’ll be glad to help in any way we can. He is a fan of the yams. Noah’s been on a roll lately with food. 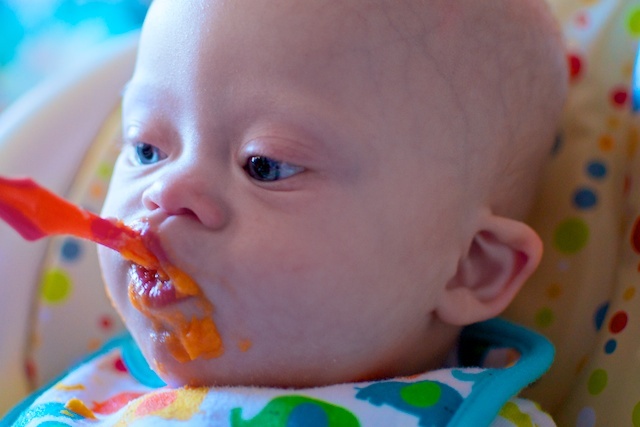 First cereal, then green beans, then a banana, then some squash, and today…..a yam! 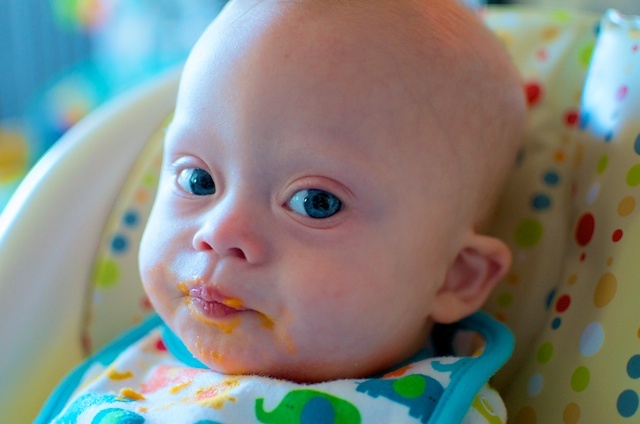 No matter what he is eating (or doing) I know one thing….he sure looks cute doing it! "All done. Now, what's for dessert?" Have you tried the Rody horse, or another tool like it before, if so let us know what you think in the comments below. 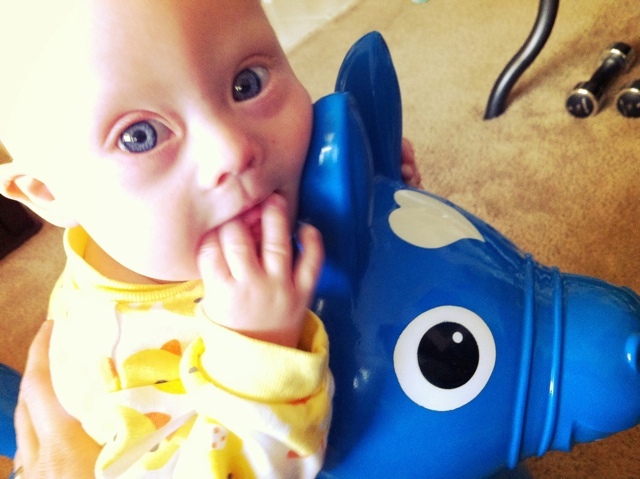 If not, do you think it looks like a useful developmental tool for your child with Down syndrome? Wow, wish I’d known about this when Jack was that age! Now he is walking and we are tackling the communication stuff. I have to say “Signing Time” is a great resource-Check it out! How old is your little Jack? What all are you guys doing for communication / speech? We know all about Signing Time. That’s a great one! How long have you all been using it? Well, what do you know, gravatar works. Thanks. Jack is 2.5. He will be three end of November. We are currently working on the Talk Tools therapy to develop his oral muscles to coordinate to make speech sounds. We blow straws, whistles, bit sticks, chew gum and blow bubbles. Loads of fun! Therapy but not therapy? We have been signing with Jack since has been able to sit independently in a high chair and sign more for food and ask for milk. He can clearly say “Nah” for no and “Daddy”…his favourite guy on earth these days. We have just added more and more signs to help him communicate even though he can’t articulate well yet. We just started with the DVDs and I am amazed at how quickly he has responded with learning the signs and moving forward. It is like he needed a new level and the visual is a perfect vehicle for it. Yeah! Good touch with the Gravatar! That will work on a ton of blogs out there! Jack sounds awesome! Talk Tools therapy is great. We’ve already looked into it, and will start it as soon as Noah is old enough to. We have some friends (www.funhouseblog.com) who have done the baby sign stuff with their now 3 year old, Seth, and he is doing so great with it. I can’t wait to hear how awesome that goes for you guys! Thanks for posting the link…are these friends of yours? just wanted to stop by and let you know what an awesome blog this is! your little guy is an angel and i love reading about your experiences and seeing the videos. this blog is a gem! congrats on your current number one spot on circle of moms top fam blogs:) (thats how i found you) i’m a mere number seven and wanted to check out everyone else on the list! hope you don’t mind i stopped by to say hellO! Thanks so much for stopping by our blog, and for the encouraging comments! I really appreciate it. Congrats on being number 7! That’s great! It certainly looks like you’ll make the top 25…so that’s awesome. My two oldest were preemies. Our pt just had us put them on their bellies on a blanket and slowly pull them on a smooth surface. By the time they were toddlers we were racing through the house like a roller coaster on those blankets ! They also had us lay down in front of them during tummy time to grab their attention but also talk, sing, or making interesting sounds behind them during tummy time. Just to get them to try and arch their little backs and turn their heads. Pretty simple stuff but effective. Great stuff! All of Noah’s doctors and therapists were HUGE on tummy time. So I totally agree with you on that! We’ve never done the pulling around on the blanket before, but it sounds awesome. I bet Noah would REALLY enjoy that! I’ll have to try it….and film it! Hey, I may get a Rody for myself! Well, maybe not, but we do have a 2 year old who may get a kick out of it. I’ll drop one in my Amazon wish list and know its there for when our Tylee gets old enough to ride one. By the way, nice shots on the Yam it Up photos. What do you shoot with? Max, let let me know if you get one, and how your son (or you!) likes it. Likes I said, the box says it can hold up to 400 pounds….so…go for it! Thanks for the feedback on the picture…I use Nikon D7000. We really enjoy it, and it gets a TON of use around here. This is a great video, and it seems like he really enjoyed it! It’s amazing what is available to help children with Down now as opposed to when my daughter was small – she’s 37 now. Keep the videos coming! I didn’t know your daughter was 37, that’s awesome. What’s she up to these days? I’m sure you guys are having a blast. Found you on facebook through a friend. Grateful to find you. Since my husband was diagnosed with ALS last year we have both loved seeing and reading posts/blogs/stories about others who have faced and met the challenges/gifts life has served up. It touched a chord in me when you talked about a new perfection. That’s what we are coming to terms with at our house. I have to admit I’m dragging my feet a little! I think just as parents have an image in mind of what their child will be like, we had an image of what our later years would be like. Now, facing a different image, I am grateful to be reminded I am not alone. We are not alone. Thank you beautiful Noah and beautiful Noah’s Father. The Roddy horse looks great but alas not all parents can afford this . Thanks for the info though, appreciate it. Thanks. I certainly can understand, but at under 50 dollars I think it certainly qualifies as an inexpensive tool (especially when compared to other physical therapy tools.). We are going to be doing a giveaway on our site for one in the near future. Everyone left such awesome comments about this horse. How in the world had I NEVER heard of this horse? My little boy is 7 months old and loves to bounce. He bounces in his jumperoo and then *tries* to bounch on me. I tell him Aidan I’m not a jumperoo BUT whatever makes him happy. You little one is so cute. I love the daily updates and pictues. IDK why my pictues isn’t showing. Any suggestions? Thanks. Be sure to let us know if you end up getting one. Oh my Gosh! Noah is so darn cute! I think I am going to look into a Rody Horse just to keep my Tessa sitting good. Thanks for the tip! I second that, Noah is so gosh darn C-U-T-E! Hmm. What is hippo therapy? And yah, we use the exercise ball also. In all honesty it was better than the Rody horse.